This winter we’ve looked at a number of indoor gardening techniques. Most recently, we looked at how to choose the right succulents and care for them indoors. However, one of the most common problems I see when it comes to growing plants indoors is overwatering. What if there was a way to eliminate this problem entirely? Aquatic plants are impossible to overwater because they grow in water! Let’s start by classifying aquatic plants as this will dictate what type of container, soil (if needed), and other design choices. First, there are true aquatic plants. These are plants that can be completely submerged in water. These plants need soil or gravel at the bottom of the container for their roots. Likewise, there are semi-aquatic plants. Their roots can be submerged, but their leaves will be above the surface. Finally, there are floaters. As the name implies, these guys float on the surface and require no soil. The first option is perhaps the easiest way to get started and experiment with growing plants in water. This is rooting cuttings in water. Wandering Jew, philodendron, and many other types of plants will grow quite well this way. Previously, we’ve looked at the zz plant and avocados. They can both be propagated using this method. Also, bulbs like hyacinths and paperwhites can be grown indoors in vases with water. 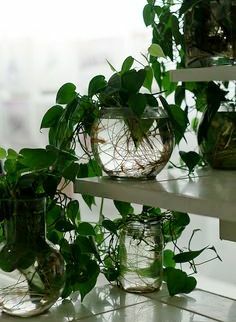 The next option are aquarium plants. These can easily be found online and in pet shops. They make terrific specimens on their own that are quite easy to grow. One of my favorites are miramo moss balls (aegagropila linnaei). “Moss” is a bit of a misnomer because they are actually a type of algae. Another easy to grow aquarium plant is anacharis (commonly called elodea). It is a great option for beginners because it is hardy, easy to care for, and easy to root in substrate. This is where we get into soil … or “substrate” as aquarium enthusiasts like to call it. There are a number of aquarium substrate blends. You want to avoid regular potting mixes because they will float and can be quite messy if disturbed. You’ll also want to top off the substrate layer with a layer of gravel or sand. Also, some folks recommend adding in some chunks of activated charcoal to help absorb smell and help keep the water fresh. Finally, are the “floaters”. Classic aquatic plants like water lettuce are a good example of this. Also, there are “wild” floaters like duck weed. I have fond memories of this plant from studying it during my college years. If you’ve ever wondered about nutrient uptake in lemna minor (duck weed), I’ve got you covered. Overall, aquatic plants make a great, low-maintenance choice for your indoor plantscape. They can be grown in variety of containers, and can be a great conversation starter. Check out the list of care tips below to help you get started. Choose a bright location like a windowsill that gets at least 4-6 hours of light. Use fluorescent or LED grow lights as they produce less heat. Don’t clean the container with soaps. It can make it difficult for the plants to absorb CO2 and photosynthesize oxygen. Don’t replace the water completely. This can increase the chances of algae growth. Water can evaporate over time and need to be replenished accordingly. Use pebbles or tablets of fertilizer instead of normal liquid fertilizers. Use pieces of activated charcoal to help make the water more clear and eliminate bad smells.